We have heard so many stories from our customers about how their Tap2Tag device has changed their lives and given them and their family's peace of mind. So now we want you to help others by offering them the opportunity of winning one of our stylish K1 wristbands. All you have to do is comment below and tell us why your friend needs a Tap2Tag device. Please don't quote their full name; initials or first names will do. There are 5 K1's to give away. As a special treat we are also giving away to the nominator one of these brilliant bracelets (RRP £49.99 each). Well done to the winners and thank you all for entering. To confirm your details so we can send out your prizes please go to http://eepurl.com/dumWXD to update your details. We will then email you to confirm the address. Usual competition conditions apply. All nominees must be over 18 years old and the delivery address for the products must be in the UK. The closing deadline is the 31 May 2018 and the nominees will be notified within 7 working days by email. The judges decision is final. No monetary alternative is offered. Your comments will be reviewed and shared on our website and any other social media platform. This entry was posted in Competitions on 9th May 2018 by Tap2Tag. Will Apple Finally Adopt NFC? It's almost a year since Apple added support for reading NFC tags with an iPhone with their iOS 11 update. Since then there has been increased demand for NFC tags, and the Connected Things industry in general. The increase in demand for the technology and Apple's slow adoption of the technology has been a frustration, particularly for us at Tap2Tag. The iOS 11 update didn't really live up to the hype when it launched in September 2017. Yes, NFC was included within each iPhone but you could only use this if an app was used to read the NFC tags. As GoToTags remark in their recent article, there is already an obvious native app on the iPhone that should handle tags with URLs and it's called Safari. Android devices use this method to read such tags and it makes so much sense for Apple to do the same. Companies are using NFC as part of their "Connected Things" strategy and they are seriously looking to gear up their deployment of NFC. But there has been some reticence due to Apple's intransigence in adopting the technology. But there are signs of a sea-change. Apple will be announcing their options for an iOS 12 update on June 4. The chatter on the newswires is that Apple will have to seriously look at opening up their NFC chip to allow "Green" scanning of NFC tags. So we have marked a date in our diary and will be watching with interest. To read the full article from GoToTags click here. This entry was posted in Virtual PR Room on 3rd May 2018 by Tap2Tag. If you work within the NHS in the UK or other medical practitioners around the world we would love to hear from you, especially if you have come across Tap2Tag during your working days (and nights)! This also extends to anyone working in front line support including the police, victim support and paramedics. Please add you comments below and make sure you also add your name, job title and where you work. This really helps people understand the impact of our little band (key fob/card). If you can please give examples of how the band helped. This entry was posted in Case Studies on 23rd March 2018 by Tap2Tag. For those of you who are a fan of our Facebook Page will no doubt be aware of our little pooch, Tilly. The weather on Saturday was glorious and Tilly was out for a walk with her family. Being such a wonderfully clear afternoon it was an opportunity for the local balloonists to venture to the skies. Unfortunately Tilly does not like hot air balloons and as soon as she heard the hot air blasters on the low altitude balloon she bolted. The area she was being walked has beautiful woodland,open spaces and covers many square miles. Unfortunately none of the human walkers had their mobile phones with them (and neither did the dogs) so they could not call back to home for reinforcements to continue the hunt for Tilly. So mum had to head back to the car, drive home to get the rest of the family whilst the eldest son continued the hunt. It was starting to get dark on the way back to the common when my phone started ringing. Someone had found Tilly, scanned her Tap2Tag Pet Collar and found my number. Within two minutes we were reunited with a tail-wagging Tilly, to our great relief. And this is where our real problems started. Our 24 year old son was still hunting for Tilly in this vast common area. It took another 40 minutes to find him in the gathering gloom! So lessons to be learnt from dog walking in wide open spaces. Tilly was none the worse for her adventure but she is only back with us because we could store multiple contact numbers on her tag and update them whenever we like. Can your pet tag do that? This entry was posted in Pets on 19th February 2018 by Tap2Tag. As a biker and lifetime HOG member I understand the need to stay safe when riding on two wheels. Providing the relevant information to emergency services, if you are unfortunate to be involved in a road traffic collision (RTC), and being able to provide this information quickly and efficiently is critical. Paramedics suggest that the first 10 minutes after a RTC are the most crucial. There have been a number of initiatives in the UK to help protect bikers. When taking my Advance Motorcycling Test I was made aware of the "Green Dot Scheme". The idea was to place a green dot on the right hand side of your helmet to notify paramedics that there was an emergency card inside the rider's helmet. It's a great idea but has a few problems. The first is awareness. Having spoken to over 1,000 paramedics throughout the UK hardly anyone had heard of the scheme. The scheme is promoted in the south west but members of the South Western Ambulance Service and the Great Western Air Ambulance had not heard of it. The second issue is data. The card shows the amount of space you have to disclose your medical information. As an ageing HOG my medical conditions are a lot longer than one line! The third issue is the helmet. Paramedics will ensure that your helmet is always kept with you in hospital as it provides evidence to the police and hospital teams about the RTC. But paramedics will be reluctant to remove the helmet if there is inevitable head trauma or spinal injuries. So the location of the card INSIDE the helmet will delay the time taken to get to the important information about the patient. 1. "I've got ICE contacts on my phone"
2. "Driving licence in my wallet, which is in my pocket"
3. "I've got a dog tag around the neck"
4. 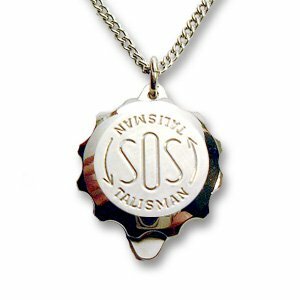 "I've got a SOS Talisman necklace". These are the pendants with a hidden compartment where you can write out your medication. 5. "I have used the health ID app on my iPhone to store my critical information"
6. "DNR tattooed on my left breast"
7. "My number plate and ID in my wallet should suffice?" 8. "I have an etched dog tag with my details on it"
Let's deal with these points in turn. Points 1 and 5 fall away because paramedics will NEVER check your mobile phone at a RTC. Firstly the phone may well be smashed but secondly there is protocol from the Ambulance Trusts to deter all paramedics from checking phones and wallets/purse at a RTC. The reason is worrying and part of our litigious society. There have been too many cases where Ambulance Trusts have been sued by "patients" stating that they had large amounts of money or high end mobile phones that had "obviously" been stolen by the paramedic attending the scene. Hence the no phone/no wallet searches at the screen. Point 2 will give the attending emergency services proof of identity but that's about it. Your driving licence does not tell the paramedic attending about the medication you are taking or who your next of kin are. Point 3 and 8 - Dog tags are GREAT! Paramedics are trained to look for medical information over the heart and on the wrist (the main blood lines). The one problem with a dog tag is the limit on the information the hold (name, emergency contact number and one line for medical conditions). Not too good if you have more than one emergency contact or you are taking more than one form of medication. But they will be seen and that's a good thing. Point 4 - The SOS Talisman. On the face of it this is a great idea. Store your handwritten information on a piece of paper and place it in the hidden compartment in the necklace. However paramedics hate them. They are fiddly to unscrew, the writing is often illegible and they have no idea how old the information is on the paper. Sarah Willingham (formerly from Dragons' Den) much preferred this method but she had obviously not spoken to anyone in the emergency services. Point 6 - "DNR on the left breast"
Loving the commitment to body art and this does give a clear instruction. Did you know that this is not binding in law and each and every Trust in the UK will have their own procedures with dealing with a "Do No Resuscitate" instruction. This usually means that a written document needs to be available to the attending responders before they can accede to that instruction. And what happens if you can be saved but are on medication or you want you nearest and dearest to be with you by your hospital bed. I'm not too sure how many people are willing to have the mobile numbers of their next of kin tattooed on their right breast (and what happens if mobile numbers change). It's all a bit of an inky nightmare! 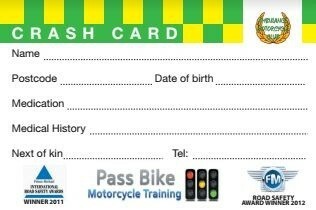 Point 7 - "Number plates and licence in the wallet"
Anyone see the problem with this? If you are riding in France how long to you think it will take the French to contact DVLA for your details? They have your licence (if they bother to check your wallet) and, after a significant amount of time they might get your name and home address. But what about your next of kin? You are multiple injuries and you have a 50% chance of pulling through. Wouldn't you want them to know that you are in peril? What is clear is that bikers are doing what they can to protect themselves when riding but the solutions are incomplete. AND THAT'S WHY TAP2TAG REALLY WORKS. 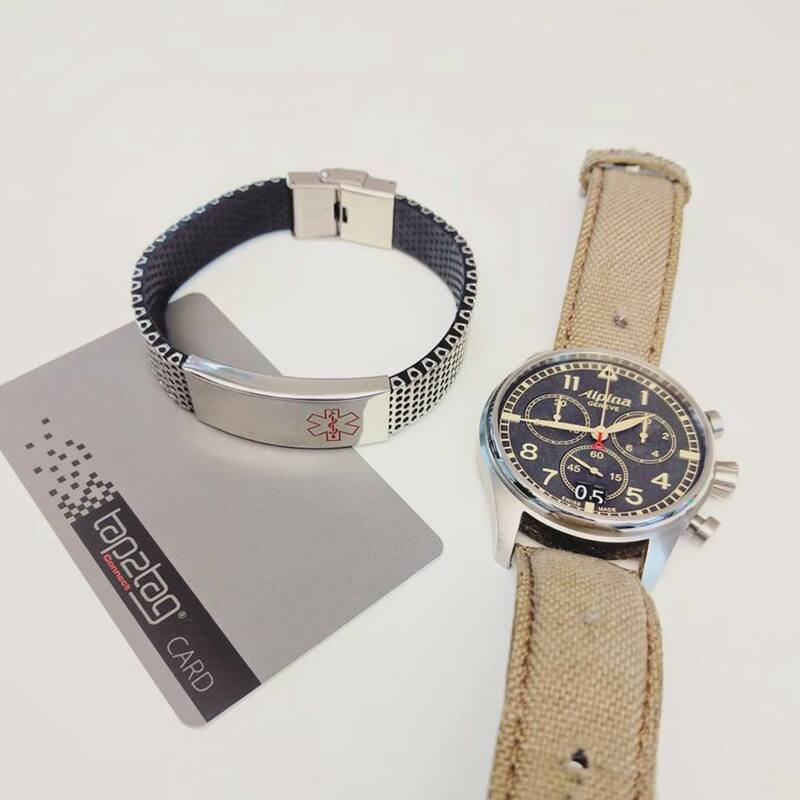 A Tap2Tag wristband means it sits on the blood line. The information can be accessed within 3 seconds when a paramedic uses THEIR OWN phone to scan your data. The information you can store is virtually unlimited and is date stamped to show first responders when it was last updated. You can even store documents within your Tap2Tag medical profile such as a prescription, Hospital Passport, Care Plan or DNR letter. It also sends an automatic text to your next of kin when the information is scanned. There are plenty of systems out there to protect you when riding out but NONE have the complete solution offered by Tap2Tag. This entry was posted in Uncategorised on 18th December 2017 by Tap2Tag. Tap2Tag Connect has launched with overwhelming critical acclaim at Startup Fashion Week in Toronto, Canada. 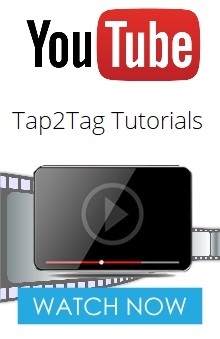 But what is the Tap2Tag Connect system? This is a revolutionary business system that allows you to connect...and keep connecting with business contacts you actually meet. How many times have you been sent yet another connection request from LinkedIn? If you reviewed your LinkedIn contacts what percentage of those contacts have you actually met? Bet it's quite low. Connect from Tap2Tag replicates the business card "transaction" that means the connection you make are only based on ACTUAL interactions. So how does it work? You get a Tap2Tag Connect card and create your own business profile. When you have a meeting you ask your new contact to tap your business card. The TAPPER (as we call them) can then download your business card directly into their contact directory. Better yet, you will also get their name and email address, allowing you to follow up at a later date. How many business cards have you got sat on your desk or in the glove compartment of your car but can't remember where you met? Worse still are the hours you spend entering 20+ business cards following a networking meeting. How much easier would it be to automatically collect their information when you pass over your business card? No more re-typing business cards into your CRM or address book. And then think of the conferences you attend. How much easier would it be to ask people to tap your business card at your stall. They would get, not only your business details, but also promotional literature sent to their inbox by email. You would get their name and email address, which you can later export into your CRM for marketing at a later date. The sales process has already started and allows you to cement the relationship. We are taking delivery of our first CONNECT cards in the coming weeks but why not set up your own Business Connect profile now. Just go to www.tap2tag.me and register for account. You can then set up your own CONNECT profile for FREE. This will allow you to share this with anyone who presents their Tap2Tag CONNECT card. Create your business Profile now and, the next time you are presented with a CONNECT card, you will enter our draw for a FREE prize. This entry was posted in Competitions, Connect on 25th October 2017 by Tap2Tag. 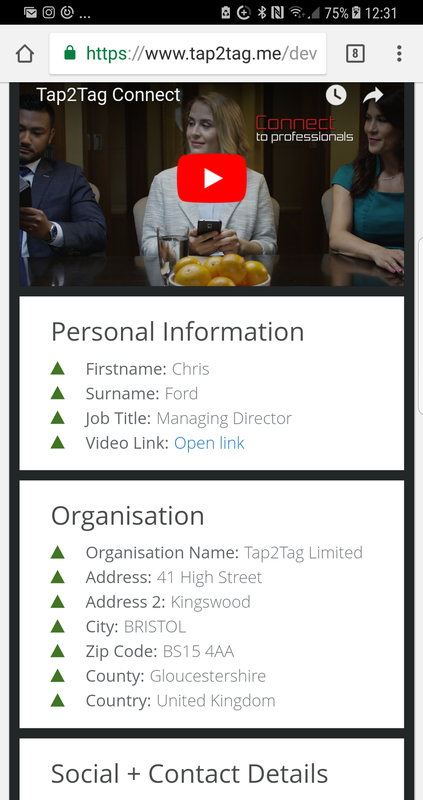 After 12 month's of development we are pleased to announce the arrival of Tap2Tag Connect. We are now in our final evaluation program before we formally launch the system at the Start Up Fashion Week in Toronto, Canada on the 20 October 2017. Tap2Tag Connect is starting off with the production of the universal business card. When you are attending a meeting you just bring out your Connect card and allow your new contact to tap the card. They will see you standard business details including your profile image, telephone numbers and logo. But you can also embed a corporate video, your social media links and even attach PDF files containing marketing literature. The Tapper, as we call them, can then scoot to the bottom of the profile and download your "Business Card" directly into the contact on their phone. No need for re-typing your details from that paper card you have in your wallet or purse. And no need for those business card scanning apps that only seem to work half of the time. Before they download the card you will be asking for a little bit of information about themselves. This will include their email address. As a result you will know who has had your card and be able to contact them at a later date. Now you just slip your card back where it came from and you have done your bit to save the planet by cutting down on your printing costs. In fact, you don't really need their card either, so a double bonus! By logging into your Tap2Tag account you can see the Connections you have made. If they are new to Tap2Tag Connect you can also choose to formally "Connect" with them by sharing other elements of your profile that you might have hidden away on your public profile i.e. Direct line number, email address etc. One other handy feature is that your new contact will automatically be sent a copy of your business card by email (as a vcf file) along with any of the documents embedded into your profile. Imagine you are at a trade show or networking event. You can simply hand around your Tap2Tag Connect card and everyone who taps it will automatically get your electronic business card as well as your sales literature. You are already two steps along the road to securing that new business! More features are coming. These include the ability to download your Connections and allow you to upload these contacts into your own CRM. We are also working on an upscale version of the system for corporate clients where the cards are individually branded and controlled. If you like what you see please add your comments below. This entry was posted in Connect on 28th September 2017 by Tap2Tag. Apple has announced details relating to IOS 11 will have support to allow iPhones to read NFC tags and NDEF messages! This means that all iPhone 7 and newer will be able to read NFC tags just like Android. This entry was posted in Uncategorised on 9th June 2017 by Tap2Tag. On 1 June 2017 an article was published on the TechSpark news site all about Tap2Tag. It followed an initial conversation with Sam Downie, an epilepsy advocate based in Bristol, UK. This entry was posted in Epilepsy, Press Releases, Products We Like on 2nd June 2017 by Tap2Tag. Yorkshire based Kiroco Technology have signed an agreement with Bristol based company Tap2Tag to produce exclusive NFC wearables that have the potential to save lives. Tap2Tag is leading the field in medical wearables producing a medical alert device that is designed to help first-responders and paramedics gain instant access to critical medical information in an emergency. This entry was posted in Press Releases on 24th April 2017 by Tap2Tag.